Over the last year, migration from Central America has become the centerpiece of the immigration policy debate, as a still-increasing number of families and unaccompanied children from El Salvador, Honduras, and Guatemala arrive at the U.S.-Mexico border seeking asylum. As we noted in November 2018, the Department of Homeland Security’s (DHS) Fiscal Year (FY) 2018 Southwest border apprehension numbers showed that family unit apprehensions reached historic highs, even though overall apprehension levels were low compared to the peaks in the 1980s and 1990s. DHS’s February 2019 apprehensions data continues this trend; while overall apprehensions remain low compared to earlier periods, family unit apprehensions reached a historic high, meaning that managing this population will remain a long-term challenge for the United States. The February 2019 apprehension numbers mark the highest peak in overall monthly apprehensions between ports of entry since 2009. In February 2019, U.S. Customs and Border Protection (CBP) apprehended 66,450 individuals, which exceeds all monthly statistics since March 2009 when authorities apprehended 68,740 individuals. These figures show that overall apprehensions rebounded, after dropping to historic lows in 2017, and continued an upward trend over the last three years. This increase is due almost entirely to individual arrivals from countries other than Mexico. However, a review of yearly apprehension numbers show that current levels remain at historic lows. In FY2000, for instance, immigration authorities apprehended a monthly average of 139,703 individuals, with December 2000 marking the low (73,458 individuals) and March 2001 marking the high (223,305 individuals). After this peak year, monthly apprehensions dropped steadily and stabilized through FY2018, largely due to the decrease in Mexican migration that drove apprehension rates in the 1980s and 1990s. 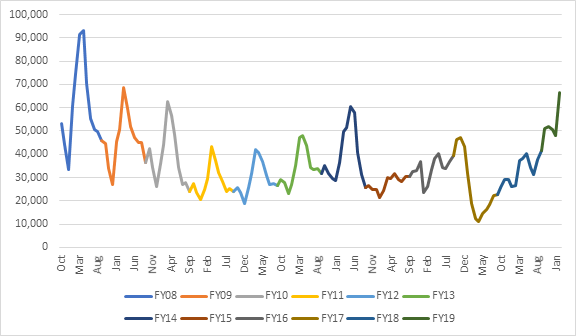 While the number of apprehensions in FY2019 may pass FY2009 levels, the historical data suggests that current rates may remain far below those seen in peak years like 2000. 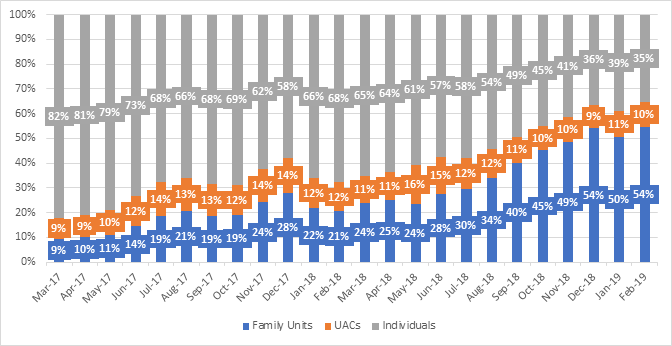 The February 2019 CBP data shows that the number of family units apprehended at the border rose to new monthly highs. 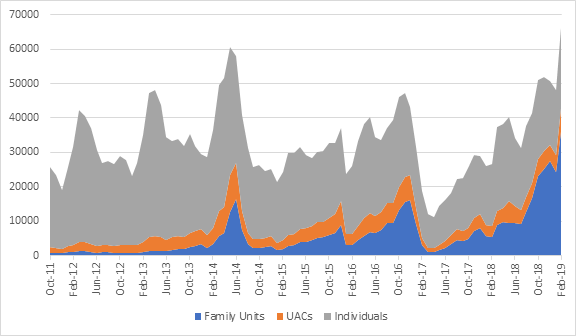 As Figure 3 shows, the number of family unit apprehensions hit 36,174 in February 2019, a level that exceeds the previous peaks of December 2018 and June 2014 when CBP apprehended 27,507 and 16,330 individuals in family units, respectively. In the case of unaccompanied children, immigration authorities detained 6,825 individuals, which is lower than the peak month of June 2014 when 10,620 children were apprehended at the border. The new trend shows family units now make up the majority of monthly apprehensions. Since 2017, the increase in the number of family unit apprehensions has also driven demographic changes in the migrant flows arriving at the U.S.-Mexico border. As Figure 4 shows, apprehensions of family units and unaccompanied children increased from 18 percent of all Southwest border apprehensions in March 2017 to 64 percent in February 2019. The percent of individual apprehensions decreased from 82 percent to 35 percent during the same period, marking the lowest levels for this category since October 2011. Although we cannot predict if these patterns will continue in the future, this data confirms that families and children have become the primary groups driving migratory flows to the U.S.-Mexico border over the last year. This dramatic demographic shift has major implications for managing migration along this border. Processing the large influx of family units seeking asylum has stretched a border security system designed to deter, detain, and repatriate a flow of single Mexican men seeking work. Congress has begun taking bipartisan steps to address these gaps in the immigration system’s border management infrastructure. The recently-passed FY2019 appropriations for DHS set aside $415 million to strengthen CBP’s humanitarian assistance capabilities, including funding for medical care, transportation, and food and clothing for migrants. The bill also allotted $192 million to build a new CBP processing facility in El Paso, TX, and expanded the humanitarian facilities in CBP’s McAllen Central Processing Center. Finally, the bill provides funds to increase the number of immigration judges from 484 to 534 to process the immigration case backlog that includes asylum claims. While Congress should take other steps to strengthen the United States’ surge capacity to adjudicate asylum claims more rapidly, this appropriations bill marks a positive first step towards developing a modern border infrastructure that makes managing migration—not simply deterring migrants—a key goal of our border strategy.